The burial register of St Margaret’s Church shows that 218 men died between September 1809 and the following February. Other temporary Barracks had been set up in and around town, the maltings building close to Stoke Bridge, now converted to flats, was used. A return to peace saw the temporary sites mostly demolished. Squatters living in very poor conditions used some of the huts. In 1795 a permanent barracks for cavalry was built in St Matthews’s parish close to what has been known since as Barrack Corner. St Matthew’s Church became the garrison church. There were large parades there on a Sunday morning. The first regiment to move in was the Second or Queen’s Regiment of the Dragoon Guards. 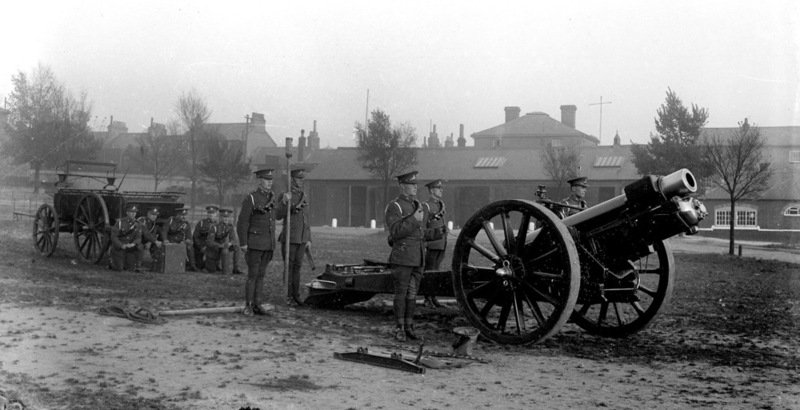 The barracks were taken over by the Royal Horse Artillery. The barracks remained until 1929. I have not found any record of a formal closing, the use of the site seems to have just run down. The council bought the site for eight thousand pounds and built Geneva Road and Cecil Road with around 100 houses. Every trade in town must have been affected. By the time the barracks closed the population of Ipswich was over eighty-thousand. Their departure must have come as a blow to traders during the depressed years of the 1920s and 30s. The huge walls of the barracks still stand at the bottom of gardens around the site; some apparently with tethering rings for horse’s set into them. Several broad arrow government marks can still be found round the site. Barrack Lane still has the gate posts with stone balls on top, reminding us of the thousands of men who marched through them to serve their country in conflict and ceremonial occasion. HMS Ganges was a Royal Navy Training base at Shotley, Suffolk. Ganges, in the early years was afloat in Harwich Harbour, and from 1905 until 1976 as a shore base.